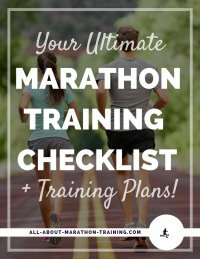 Once you finish a half marathon or marathon you may be wondering how to stay in shape until your next race or training schedule starts. 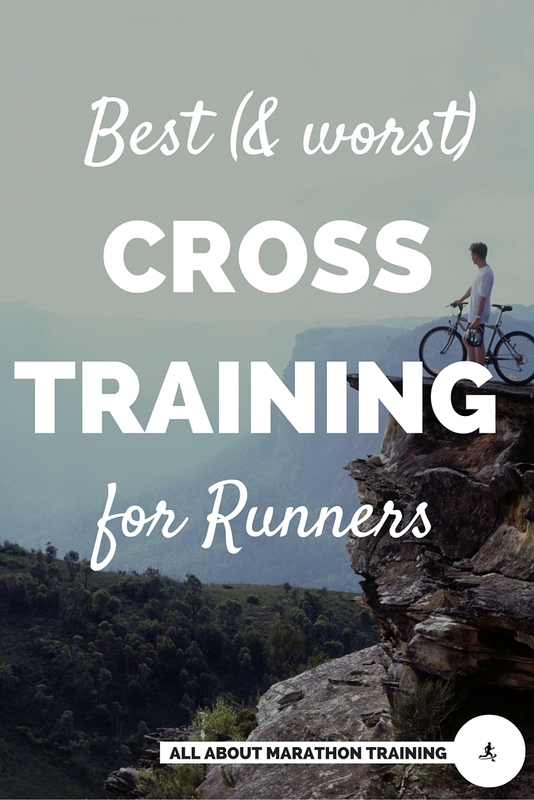 Especially as spring edges into summer and you wind up your spring races a lot of runners will take a short break in between races and wait out the hotter months. 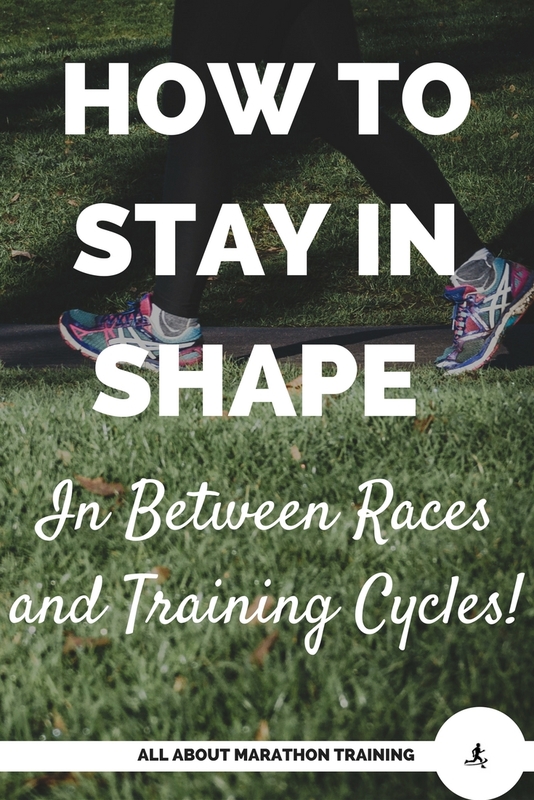 A common concern though is how to stay in shape and not lose your fitness in between races especially if you are going to be challenging yourself even more with the next one. Our goal then is to keep our fitness level. We might not be at our peak which is what we are hopefully achieving by race day but we want to be able to keep that fitness up so that we can start a new training plan with some sort of base. So today, I wanted to give you a plan of action to help you achieve this goal and stay in shape! 1. Focus on exercising aerobically. First off since running marathons and half marathons are aerobic (require oxygen to produce energy to allow us to run) in nature we want to be sure that we are mainly focusing on including aerobic exercise into our routine. This will help keep our Vo2 fitness up (the gold standard for measuring our aerobic fitness). If we are exercising aerobically even when we are not training for a race then when do start training again it is not going to seem so hard to get back into the routine. We will first have to build back our aerobic fitness level and then try to build up our endurance and speed. Or just keep at the running! Also, something I like to do at the start and finish of each training schedule is to take a Vo2 (aerobic fitness) test to see how I have progressed (or digressed!) 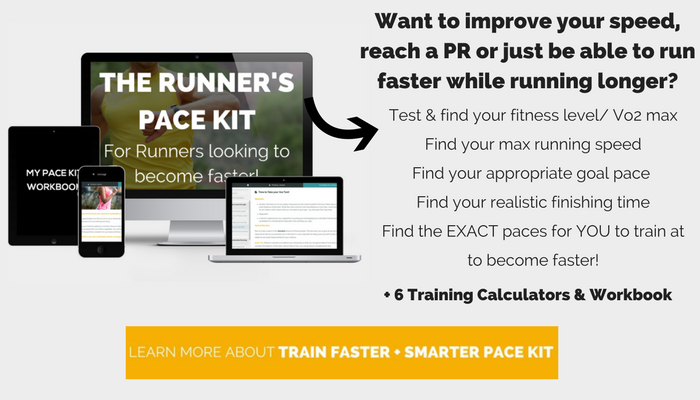 The Train Faster + Smarter Kit includes an aerobic fitness test and also helps you to set new progress goals for gaining speed. It personalizes everything to your body and fitness level! 2. Do aerobic exercise at least 3 times a week. It takes exercising aerobically at least 3 times a week to really keep our aerobic fitness level. At 2 times per week we start to see a gradual decline in our fitness. So always aim for at least 3 times a week whether it be a walk, jog, or bike ride if you want to stay in shape! 3. Exercise for at least 30 minutes to an hour if you are doing low or moderate intensity exercise and at least 20 minutes for vigorous intensity exercise. So if you are planning on going on a leisurely walk or bike ride try to get in an hour. Remember that the lower the intensity level you are working at the longer you need to be doing it. If you are going out for a run which is considered high intensity than just do at least 20 minutes. 4. Strength Train. It's too powerful to ignore. Strength training is highly beneficial in weight control, bone health, and just overall quality of life not to mention it's toning and tightening powers! It's really important not to ignore the benefits that strength training can give us especially when we want to stay in shape. The ACSM tells us to get a bout of strength training in at least once but preferably twice to three times a week. I like to work upper body muscles on one day and lower body muscles on another day. However if you are doing a total body workout you might be able to squeeze by doing it once or twice during the week! Strength training during your off season is even more important and will give you an extra head up if you are planning on including hill and speed training in your next race training or if you want to earn a goal time for your next marathon or half marathon! It doesn't take a long strength workout to be effective and see results that are worth it! You really only need about 15-20 minutes per session. Try to get in about 8-12 reps and do 1-3 sets of each exercise. 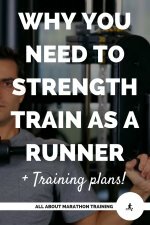 Here's a beginner's strength training guide for runners and an intermediate one too! Also the 12 week Half Marathon Weight Loss Challenge comes with 12 sets of Strength Workouts each week! So as you can see it's pretty basic but includes aerobic exercise 3x a week for at least 25-30 minutes and some strength training for about 15-20 minutes 2x a week. The aerobic exercise includes different forms (cycling, running, and swimming) to keep it fun, varied, and helps you work different muscle groups that might get ignored when you are training for a race! The main thing though is to try to keep your routine as simple as possible. If you turn it into something complicated it can be easy to ignore it altogether and then you will have your work cut out for you once you start a new training plan!